From our spacious open-concept floor plans with our handsomely upgraded kitchens, from our sleek hardwood-inspired flooring to our in-home washer and dryer, fine living is within reach at 15Fifty5 Apartments. 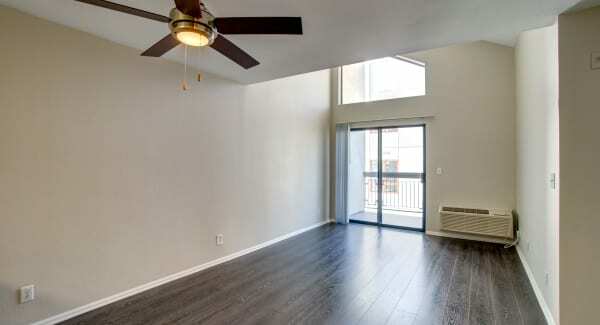 Choose from our studio, one, and two bedroom apartments for rent in Walnut Creek, California. With five unique floor plans ranging from 500 sq. ft. to 950 sq. ft., you can choose the home that fits your lifestyle. Whether you’re a professional at John Muir Medical Center, University students at Diablo Valley College, an East Bay family, or anyone in between, 15Fifty5 Apartments will support your modern lifestyle. Craft your dream life at 15Fifty5 Apartments. 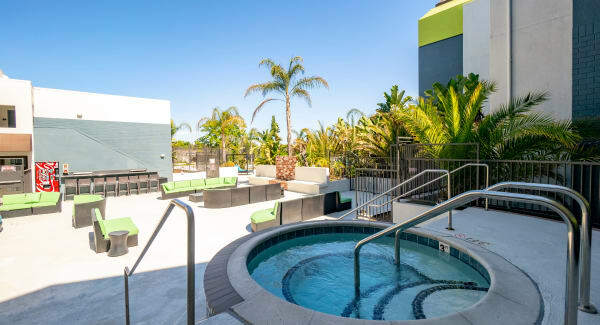 Spend your summers worshipping the California sun from our sparkling rooftop pool and sundeck. Surrounded by towering palm trees and tropical fronds, our lush rooftop is a welcome respite from city life. With our gas grills and outdoor dining spaces, you can host a casual barbecue without leaving the community. Then curl up in front of the fireplace on our rooftop lounge where you can enjoy the views and sounds of the city. Plus, you can always take advantage of our 24-hour state-of-the-art fitness center or relax in the warm waters of our relaxing spa. Embrace the resort lifestyle at 15Fifty5 Apartments. Give us a call today to set up your visit.